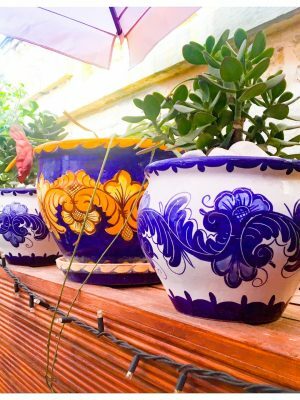 You’re off to that gorgeous archipelago in between North Africa and Italy and you want to know where to eat and drink in Malta! March 2017 was my first trip to Malta and won’t be my last. We stayed at the Corinthia Palace Spa Hotel and amongst other things, we basically ate and drank our body weight on a daily basis. Perhaps why I am now on The Exante Flexi Diet Plan! We took recommendations from locals and found spots ourselves and am here to give you 5 recommendations you won’t regret. So, if you’re looking for some places with spectacular views and culinary delights to match, you’ve come to the right place. Pescetarians (like me) and vegetarians and vegans, there’s even a gem or two for you! 1. Giannini. This must visit restaurant is set in Windmill Street, Valetta, overlooking the coast line in a beautiful old building. As you crunch your way over the pebbles to the unassuming entrance, you may be forgiven for not expecting what you’ll find inside. You’ll be met by a small, cosy area for an aperitif. Don’t miss the opportunity to chat to the Italian bar steward, who is currently studying to become a professional pianist, whilst you sip on some Maltese wine. After you’ve enjoyed your aperitif, you’ll be taken into a tiny lift, which is a bit like venturing to Narnia! Don’t let that fool you at all because when the doors open, you’ll find yourself looking straight into the restaurant, with its stylish but cosy decor, its relaxed ambience and its stunning panoramic views. We talked over breads and olives to start, then I had the mushroom soup, which was insanely tasty! I followed this with the catch of the day, which was wheeled over to me to choose from a selection. Yikes! Opening Times: Tuesday – Friday for lunch, Tuesday to Saturday for dinner. 2. Soul Food. This is a small joint on Merchants Street in Valetta. It serves freshly made vegan and vegetarian food, with locally sourced or organic ingredients. Even the wine is organic! Now, as someone who has been a pescetarian over 20 years, I never used to get excited over the prospect of a vegetarian place. It was always dry and tasteless. Things have moved on, especially over the last 10 years, and Soul Food puts that firmly out of your mind. We stopped for cake and the carrot cake and the cheesecake with homemade strawberry jam did not disappoint. Both were light in texture but packed full of flavour. It’s a great spot to while away an hour and do some people watching, whilst you take a break from meandering the old streets of Valetta . If you prefer to sit inside, there’s also a small area upstairs to eat. Opening Times: 10am – 6pm Everyday, except Saturday when closed. 3. Fontanella. 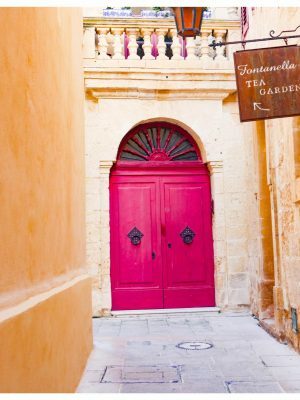 When (not if) you’re visiting the historical and architectural gem that is Mdina, this place is also must. I’ve already featured a post shot there, Navy is the New Black including some Game of Thrones set locations. Not only does it offer spectacular views, it’s also really reasonably priced. If you want to try some Maltese food, here’s a great place to sample some traditional pea cake. It’s not cake, rather a spiced pea purée inside filo pastry walls. Think of it as a cousin to a samosa and you’re almost there. They’re perfect for a snack and only 55 cents each! Fontanella is also known for more traditional cakes and even does deliveries. Whilst we didn’t have any cake, we did salivate slightly over the mouth-wateringly delicious looking cakes of our neighbours. Despite its popularity, Fontanella still has a relaxed vibe. Because of this, you may have to wait a little while to get a seat, but the views alone are definitely worth it. 5. Rickshaw. This is in the Corinthia Palace and Spa Hotel in San Anton, Attard. where we stayed for our trip. The perfect location to visit the 17th century San Anton Palace and Gardens. The Corinthia Palace itself, amongst others, houses the rather fancy, stunning and widely lauded Villa Corinthia restaurant. But, if you fancy something with an Asian twist, this is your guy. Take a drink in the Caprice Lounge, which does happy 3 hours from 9-midnight daily and make your way down to Rickshaw. You’ll be treated like royalty and the food is delicious. A smaller dish like noodles will set you back about 10 euros and prices average around the 15 euro mark and go up to 42 euros. See the menu here: Rickshaw Menu. Rickshaw Restaurant Website (10% off takeaway bookings made before 7.30pm. Available Tuesday to Thursday only). 4. StrEat Whisky Bar & Bistro. This little place is in Valetta. Just off Strait Street, which has seen a massive regeneration and resurgence in the last few years. Gone are the seedy bars and hookers serving the naval fraternity and here are some quirky, trendy hip joints to eat and drink. For a more discerning crowd than you might find in the very lively Paceville area. As you can imagine, most of the drinks are whisky based and their list is seriously extensive! I’m not a whisky fan, but I still loved this place. It also has a Bistro within its caved walls. We didn’t eat there, but you can check out the StrEat bistro menu, if you want to make a booking. We took a peek at what was on the plates and would definitely go back for food. Opening Times: 12pm -1am Monday-Thursday. 12pm-3am Friday. 12pm-2am Saturday. 6pm-1am Sunday. Have you been to Malta? Did you try any of these places? I've been to Malta a few times but missed these hidden gems. Next time I go will definitely make sure I try them out. Oh a walk down memory lane! I stayed in the Corinthia, too :) So beautiful! Great suggestions! Really! ☺️We loved it. The staff were so amazing and it was such a nice break. Will definitely go back! Lovely places! I have never been to Malta but you discovered great places to eat! the frenchie mummy recently posted...Living Arrows 20/52 – Back in West Sussex! Gosh yes! You could be in your element there. So much beautiful, fresh food. And more than enough choice for a pescetarian like me! This is great as I've been talking to my husband about going to Malta with the kids in the next couple of years - so I'll save this as a reference - Thank you! I have never been to Malta but planning a visit soon. Sounds like a fab place. A friend of mine is from Malta and she always talks a lot about how great the food is there. Seeing your wonderful photos tells me that she needs to start cooking for me, not just telling me!